The skyline of the tuffa city of Sorano with the panoramic terrace Masso Leopoldino at the center below a blue sky illuminated by warm evening light. 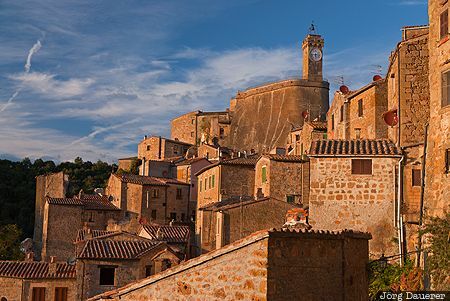 Sorano is in the province Grosseto in the southern part of Tuscany, Italy. This photo was taken in the evening of a sunny day in October of 2009. This photo was taken with a digital camera.